We have had a busy 3 years with Caleb in Scouts. He is working towards the Top Award, known as a Springbok Scout here in South Africa. This award consists of two parallel things, advancements and badges. You can do these advancements at your own pace, or not at all. Some kids go to Scouts to have fun, some to learn how to survive in the wild and others to earn their Springbok Award. Caleb has always gone to get the most badges, the highest wards etc. He has just handed in his log book of about 42 pages for his First Class Hike. This was a two day, one night hike that each scout who wants to finish his First Class Advancement has to plan, execute and write a log on, with all the details in. At the same time as these advancements the scouts have to work on badges for First Class (a physical badge, eg. Swimming interest) and for the Explorer advancement. The scout can choose to do 1 of the three explorers, being land, sea or air. They have 6 badges to do for this. Or, like my child, you can choose to do all three! Then you may choose to do your Bushman's Thong (land), your Bosun's cord (sea), or your Airman's cord (air) or like my son, all 3! We at 1st Durbanville, and the Kanonkop district, call this a SEAL Scout. To do one of the cords you have to do 3 extra badges on top of the 6 you need to do for the relevant cord. If you plan properly you can do 21 badges to get all 3 explorers with cords. Caleb has got one badge still to do to get all 3 Explorers and all 3 cords. He has got to do the canoeist badge. He has done about 25, 26 badges as he loves doing courses. You have to be 15 and a half to do your First Aid badge. Therefore you cannot get your Explorer before then. First Aid is a compulsory badge for the Explorer. 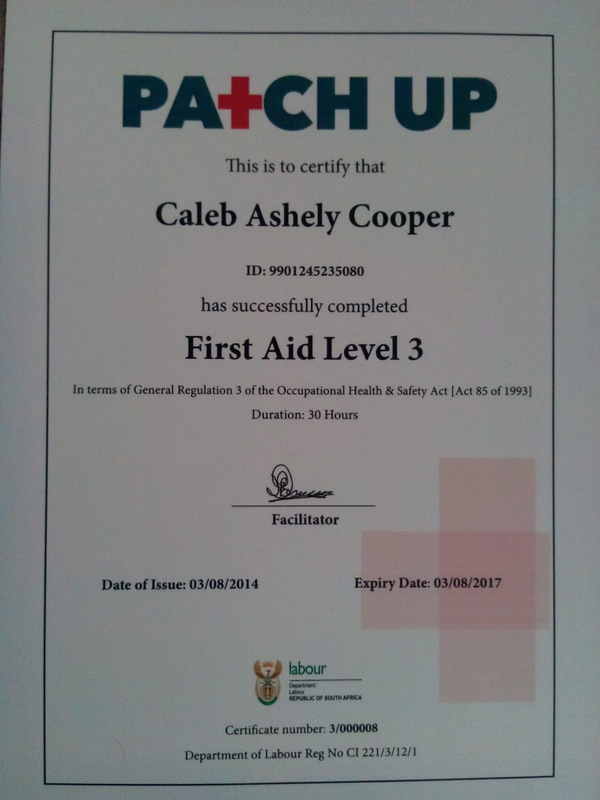 This year the First Aid Interest badge gives the scout a level 2 certification, but Caleb chose to do level 3. He passed and is now a certified level 3 First Aider. All he has to do now is the advancements for the Explorer. If he plans well he could have his Explorer by the end of the year. Not only has he chosen to do all 3 Explorers with all 3 cords, he has also done, completed and received his Bronze Presidential Award. Caleb is now working on his Silver Presidential Award. 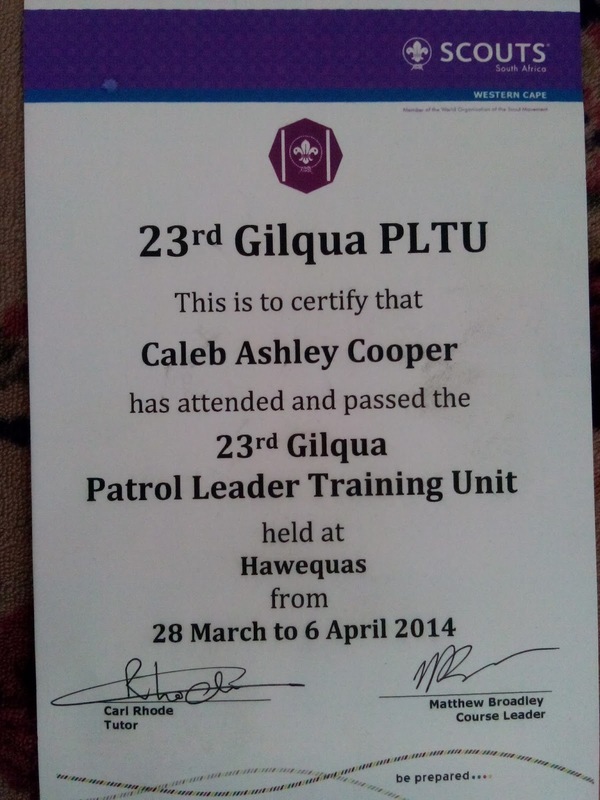 Caleb did PLTU, Patrol Leadership Training Unit earlier this year. It is a 9 day course. He loved it! He loves a challenge and takes it on full force. So far the Hike Leader course and PLTU have been his best courses. The toughest for him was the backwoodsman. He was sick for this badge course, but insisted on going. In the Western Cape we have set badge courses that all our scouts can do. They have practical and theory aspects to them. Most of them have a test which needs a 60 to 75 percent pass. The badge requirements are of a very high standard and scare me sometimes! Caleb has been able to go for all the awards and as many badges as he wants to because he is home educated. If he was at a school I doubt he would of had the time and kept up good grades. Caleb is planning to go to the College of Cape Town next year to do a vocational matric. He will be studying Engineering and Related Design. Because he has planned his scouts so well up to now, he will have the time to study hard and focus on his schooling next year. 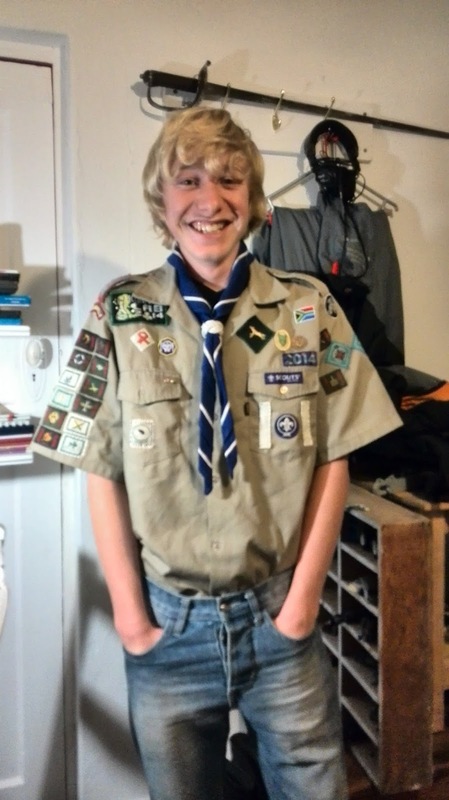 He will probably be staff on a few courses, such as Hike Leader, some sea scout courses and hopefully PLTU. Being staff though is fun with NO studying. He can get his Springbok next year, when he is 16. It is all up to him. Wearing his PLTU scarf and Bronze Presidential Award pin.